On Sept. 6, 2003, the JOIDES Resolution sailed into port in St. John's, Newfoundland, completing its 110th and final scientific expedition for the Ocean Drilling Program (ODP). Scientists aboard the ship have drilled 650 sites around the world in all of the oceans except the ice-covered Arctic to learn more about the geologic processes that modify Earth, the history of those changes in oceans and climate and the extent and depth of the planet's biosphere. The Resolution's retirement from ODP expeditions ushers in a new era for ocean drilling and research. This Wednesday, on Oct. 1, the United States and Japan  equal partners  will launch the new Integrated Ocean Drilling Program (IODP) to replace the ODP. Many years ago, scientists realized that ocean drilling technologies would continue to evolve and a new program would need to be in place to continue advancing deep ocean research. They began designing the IODP to further this research (Geotimes, August 2001). The JOIDES Resolution approaches its port at the Royal Naval Dockyard, Bermuda. Photo courtesy of ODP. The ODP will phase out operations over the next four years. In its place, the IODP will use a three-prong approach to the new research: They will have two research vessels and mission-specific drilling platforms to carry out research instead of just the lone Resolution. A heavy riser vessel  Japan's Chikyu ("Earth")  will make it easier to obtain deep sediments in areas where safety concerns had previously precluded drilling, and in regions with thick sediment sections, fault zones and unstable formations. A U.S. light drilling vessel will join Chikyu. 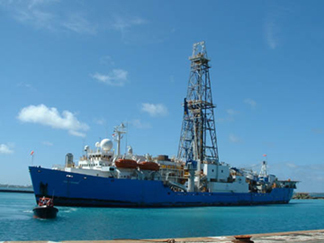 An alliance of Joint Oceanographic Institutions (JOI), Texas A&M University and the Lamont-Doherty Earth Observatory of Columbia University has entered into negotiations with the National Science Foundation to operate the light drillship. JOI is a consortium of 18 universities and research institutions, and along with partners, has been managing ODP since 1985. Plans are already underway for countries in Europe and elsewhere to sponsor the mission-specific special platforms, such as those to drill in shallow water and ice-covered regions. Although there are no plans for drilling in the initial seven to nine months of the IODP, the scientific advisory and planning committees will be working. Science and operations planners met last week in Japan to review project proposals and develop a schedule for drilling with the light drillship beginning early next summer. The heavy vessel is set to begin operations in October 2006. While ODP expeditions may be officially finished, researchers' work is never done. Now the long process of analysis begins. "Research on the ODP cores will continue well beyond this transition period," says Kasey White with JOI. "Scientists are still using cores from [the Resolution's] predecessor," and will for years. Transocean drill floor crews prepare the "under reamer" drill bit. 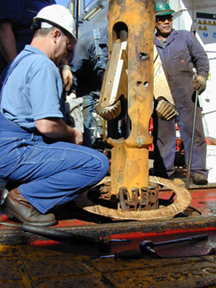 The under reamer is lowered through and out the bottom of a 16-inch metal pipe (casing) that has been placed in the hole. When crews pump water through it, the shiny arms (with cutting structures on the bottom) extend outward and rotate. They can then drill a hole larger than the pipe through which it was passed. Photo courtesy of ODP. In the final leg of the Resolution's 18-plus years of service, the crew drilled a 1,800-meter hole 4,600 meters beneath the ocean surface off the Grand Banks east of Newfoundland to examine the separation of Europe and North America. The scientists will now study the core of deep sediments and crustal rocks from this breakup that they collected during this two-month journey. The Resolution has drilled off the coast of Spain and Portugal four times, so researchers already had a good idea of what happened on the European side.